Of all the beautiful manuscripts from the Middle Ages that have survived, none is more common than Books of Hours. In fact, it has been said that “Books of Hours are now more widely scattered around the world than any other object made in the Middle Ages” ( from: “A History of Illuminated Manuscripts “). 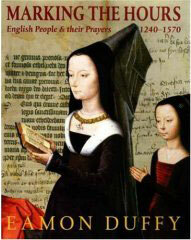 Books of hours provided a framework for lay people to practice monastic devotional routines. After the upheaval of the Black Death in the 14th century, the popularity of the form surged and, by the later Middle Ages, these books were mass produced. One of the most famous and finely painted Book of Hours is the Très Riches Heures. My favorite illustration, however, is from the Hours of Catherine of Cleves, Duchess of Guelders (1417-1476). 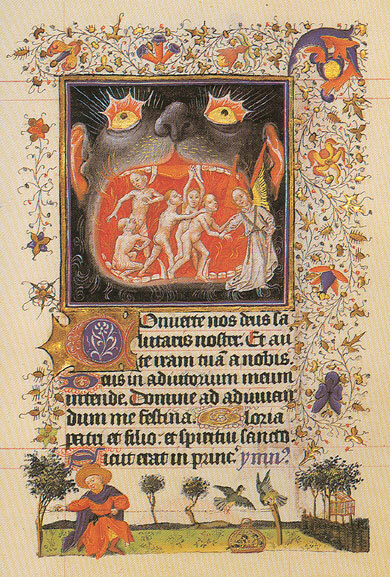 Shown below, this miniature shows an angel leading figures out of the mouth of Hell. In the Middle Ages if you were female, comfortably-off and hoped to go to heaven then you almost certainly possessed a Book of Hours. Tucked up your sleeve or kept close by in a special place, the Book was your spiritual guide to the ordinary day. It didn’t speak intimately, nor was it interested in your particular circumstances. Instead it marked the passing of the liturgical “hours” – Matins, Prime, Vespers – giving you a set of prayers and psalms to raise your spirits as you negotiated a schedule more immediately concerned with sulky servants and sickly children than the glories of the Risen Christ. The kinds of scrawls that people added to their Book of Hours included the names of favourite saints – Apollonia was good for toothache, while Zita was helpful with lost keys. If you were sufficiently rich and important you could get the artist to include a specially commissioned picture of yourself at the front of the book perhaps even – tricksy this – showing yourself reading the very Book of Hours in which you now metaphorically resided. There was even the option of getting yourself inserted into standard biblical scenes. One woman had herself painted as a spectator at the Annunciation, muscling in on Mary and Gabriel’s special moment. Others, more tactfully, waited until the Virgin was actually in heaven and had themselves painted floating on a nearby cloud. I find this type of history fascinating and I’ve already pre-ordered my copy of Duffy’s book. The thefts of hundreds of priceless historic books from the 8th-century convent of Mont Sainte-Odile including dozens of 15th century illuminated manuscripts is a great mystery story. 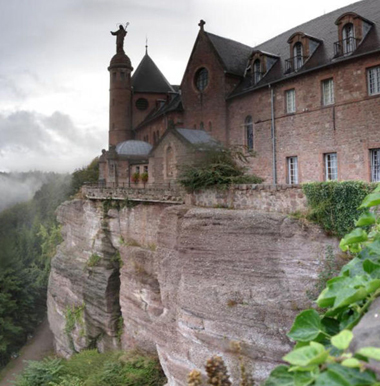 I love books and who doesn’t love intrigue especially a locked room mystery in an 8th century monastery perched on the edge of a peak in Alsace, France. It’s an irresistible combination. The 8th-century convent of Mont Sainte-Odile towers over the picturesque small town of Saverne in the foothills of the Vosges mountains. One of the most popular attractions in Alsace, tens of thousands of people a year tour its abbey, church, chapel and cloisters, dine in its hotel and restaurants and admire the stunning view across the plain to the river Rhine and, beyond, the Black Forest. Among them, from August 2000, was a curiously well-informed thief. From that date, a succession of immensely valuable works, including precious early religious texts and several dozen heavy 15th-century illuminated manuscripts bound in wood and leather, began disappearing from the abbey’s first-floor library. Police were flummoxed. In the 7th century Etichon, a merovingian duke, resided in Obernai. 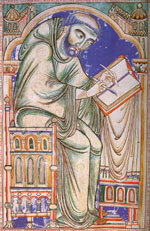 His wife Bereswinde, niece of Saint Léger, bishop of Autun and King’s councellor, gave birth to a daughter who was blind . Odile was brought up in Balma Burgundy (Baume-les -Dames) recovers the sight on the day of her baptism. “It seems it is mentioned in a highly specialised review,” she said. “This particular issue dealt with some of the oddities of Mont Sainte-Odile. The suspect, who quite clearly adored the abbey, came across it in Strasbourg University library.” The man was one of very, very few people to know of the passageway’s existence, she said. While no one could approve of stealing these books, it must have been tremendously thrilling. Imagine coming across the information about the passage and the secret room. You would wonder if it really existed. Then, making the trip to the monastery and finding the room and realizing you’re the only one there who knows about it would be too much to bear. Such temptation would be hard to resist.